As recent events indicate, Iranian, Middle Eastern, and Islamic politics more broadly have been deeply influential in world affairs. Hamid Dabashi has been a highly visible and prominent commentator on these affairs, explaining, interpreting, and providing a critical perspective. This volume gathers together his most influential and insightful writings. As one of the foremost contemporary public intellectuals and scholars of our time, Dabashi's interests and writings span subjects ranging from Islamic philosophy and political ideology to Iranian art and Persian literature, from Sufism and Orientalism to Iranian and world cinema and contemporary Arab and Muslim visual arts; and from postcolonial theory and globalization to imperialism and public affairs. There is a direct connection between his theoretical innovations and the angle of his public interventions on the urgent global issues of the day. This book brings together some of his most important writings, especially those that offer new ways of understanding Islam, Iran, Islamist ideology, global art, and the condition of global modernity. The book shows the underlying conceptual themes that unify Dabashi's wide-ranging and brilliantly insightful corpus. Dabashi combines deep knowledge of the subject matter about which he writes, and highly refined sociological, hermeneutical, and cultural interpretive skills, moving far beyond the limiting, distorted, and intellectually stifling character of reigning absolutist conventions. He places existing authoritative frameworks under close scrutiny in order to produce novel and penetrating insights. 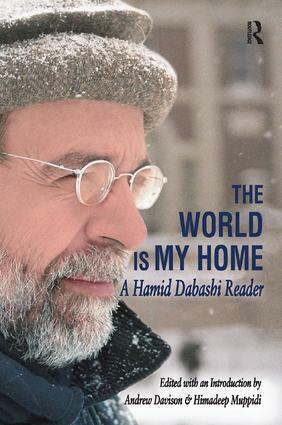 These essays reflect historical and geographical worlds that are best viewed when Hamid Dabashi's work is read as a whole, which this one- volume work makes possible for the first time.